Custom Moisturizer Sanitizer with Aloe and Vitamin E, Personalized in Bulk. Promotional, Inexpensive. FDA Approved. Made in USA. Budget Prices in America. 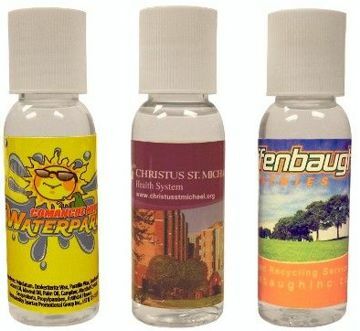 Bulk hand sanitizer moisturizer bottles, personalized with your logo in full color. U.S.-made 1 oz. instant hand sanitizer with aloe and vitamin E moisturizer. Our Anti-bacterial sanitizer kills 99.9% of household germs and moisturizes your hands at the same time. Perfect for hospitals, child care, schools and nursing homes. Budget Prices in the USA and Canada for personalized hand sanitizer moisturizer bottles. American clients pay no taxes. We will send you a proof for your approval before production. Unit prices below include your full color custom imprint, or they are for blank (not custom imprinted) moisturizer sanitizer bottles. Setup Charge is $55.00 per order (there is no Setup Charge for blank moisurizer sanitizer bottles, or for repeat orders). Set-Up Charge : $45.00 for full color imprint (one-time charge: you don't pay it on repeat orders). Imprint Size: 2.68" x 1.31"
Production Time: 5-10 Business Days after art approval. Contact us for faster delivery.